Mitch Albom's most critically acclaimed novel yet is a stunningly original tale of love: love between a man and a woman, between an artist and his mentor, and between a musician and his God-given talent.Narrated by the voice of Music itself, the story follows Frankie Presto, a war orphan born in a burning church, through his extraordinary journey around the world. Raised by a blind guitar teacher in Spain and gifted with a talent to change people's lives--using six mysterious blue strings--Frankie navigates the musical landscape of the twentieth century, from the 1950s jazz scene to the Grand Ole Opry to Elvis mania and Woodstock, all the while searching for his childhood love. As he becomes a famous star, he loses his way, until tragedy steals his ability to play the guitar that had so defined him. 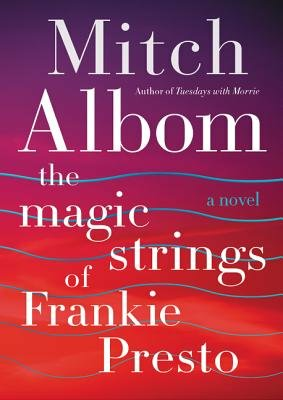 Overwhelmed by his loss, Frankie disappears for decades, reemerging late in life for one spectacular yet mystifying farewell.Part love story, part magical mystery, The Magic Strings of Frankie Presto is Mitch Albom at his finest, a Forrest Gump-like epic about one man's journey to discover what truly matters and the power of talent to change our lives. Albom's love for music is richly apparent, and the cameos by famous musicians make Frankie a cross between Fabian and Forrest Gump. Frankie and Aurora are a compelling couple, but fiction (and life) could use a few fewer instances of the woman suffering all for her genius mate, even when his excesses hurt her most. Frankie is no Morrie, but few men are. "Music" gets a little preachy at times, but his maxims about life will no doubt bring readers on a pleasantly sentimental journey about the bandmates in their lives. Mitch Albom possesses that rare ability to evoke from readers emotions of such depth that they will sit back, stunned. It has been a long time since TUESDAYS WITH MORRIE, an unquestionably poignant tearjerker. THE MAGIC STRINGS OF FRANKIE PRESTO, though, is undeniably its equal, dare I say its bigger, better brother. My advice: Snuggle down into a chair surrounded with everything you'll want for several hours of breathtaking and heartbreaking escape, and bring a box of tissues. Sink into this sad, tragic, magical and musical story. Albom blesses us with this epic tale that blends fable, parable, mystery, romance and fairy tale. And what a blessing. It is, quite simply, the most wonderful thing I've read in a long time.